“Is the glass half-full or half-empty”? 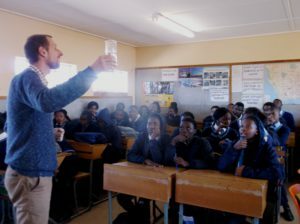 This question was asked to about 450 pupils attending Grade 10 up to 12 at Kutliso Daniels, Mrwetyana, and Hendrik Kanise High School (Alicedale) recently, during the ‘Trading Live for Mandela’ week. A dynamic team comprising Oasis and Raphael Centre staff introduced Asset-based Community-driven Development (ABCD) to the pupils and actively engaged them in testing how it feels to acknowledge and appreciate their own strengths and other assets. It was about ways to positive change and a prospective future for individuals and communities. Said Mary Humphreys (director Raphael Centre): “ABCD provides an ideal framework to position, focus and motivate active citizenship. All levels of government have called for active communities and a strong civil society. A strong civil society is necessary to balance the power held by the state and business. It all starts with me and ABCD provides the lens through which we may view our responsibilities and roles”. A “glass half full or half empty” means: Instead of focusing on what is lacking, ABCD focuses on the strengths and capacities communities already have and builds from there. ABCD stimulates citizenship by providing a self-conscious framework for understanding both how vision and change can happen. This, we found especially helpful for young people to make healthy life choices, feeling independent and strong to work hard towards fulfilling their aspirations. In interactive workshops, learners experience different types of lenses and ‘languages’ used to assess and describe a situation. For example, how does it feel to start a process by focusing on problems as opposed to focusing on the resources available for change? The former provides a rather heavy start while the latter feels more encouraging, motivating and empowering – as per the feedback from the youngsters. Sanelisa (Raphael Centre) was impressed by some interesting debates which arouse around the question if money was the most important asset. With surprise students realised that money might play some important role in economy but loses its value if one cannot exchange it with all the other forms of resources people have and can produce themselves. Many pupils used the possibility to sign-up for the full 3.5 days ABCD course which is intended to happen during school holidays. Laurelle Brooks (Oasis) says: “What stood out was that some of the children took the introduction serious and started to think in terms of ABCD – which is “start with what you have and build from what you know”. 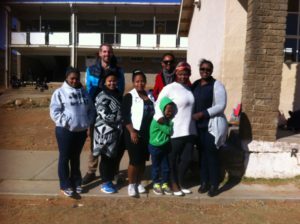 The ABCD-introduction team: back from left to right: Niels Vandereyken (Oasis), Sanelisa Mtwalo (Raphael Centre) – in the front from left to right: Farren Du Plessis, Laurelle Brooks, Allistene Adams, Berenice Matroos, Nomaxabiso Fani (Raphael Centre).